Grinding attachment with a pivot point for the swing arm. Notch has been cut into the table to hold round work. 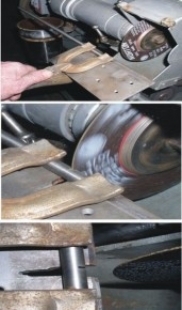 Intended to enable the end-on use of thin grinding disks meant for a surface grinder. Good idea. I had such a cutting disc disintegrate on me when I tried to use it freehand.